A 1-year-old tabby cat was rescued from a horrible fate yesterday in Queens, NY. Someone tied a cable cord around the feline’s neck and then tossed the animal into a tree. Fios after he was rescued by Verizon workers. Fortunately, some Verizon employees were nearby working a job. They heard the cat’s cries and stepped in to help. No one knows how long the cat was in the tree. Another worker, Robert Munday, used a bucket truck to reach the feline, who was reportedly hanging on to a tree limb by one leg. Munday grabbed the choking cat, and cut the cord around the animal’s neck. 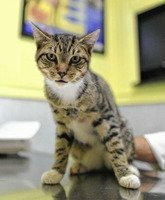 The cat, named Fios, was sent to a nearby animal hospital by a member of Four Paws Sake, an animal rescue group; the cat is underweight, but otherwise in good health. If no owner is found by the weekend, he will be put up for adoption. Fios (FiOS) is the name of Verizon’s bundled television, telephone, and Internet service. CatTime.com salutes Robert Munday and Vinny Cassidy for their act of kindness.